All of us at Carrick-on-Shannon Rowing Club were deeply saddened to hear of the news of the passing of our esteemed and beloved Honorary Life President Mr. Tony Keane on Sunday last after a long illness. Where do you even start to remember a man who lived, loved and fought for Carrick Rowing Club over eight decades and how could we begin to thank him for his dedication to generations of Carrick rowers and his endless loyalty to the town and the club he adored. Tony began his relationship with Carrick Rowing Club in 1946 at the tender age of 11. Tom Lowe introduced him to the basics of a sport that would capture his imagination and instill in him a lifelong obsession. Tom’s grand-niece Aoife is a current junior in the club. He rowed in his early days in a junior four with Freddie Moran, Cathal Gilroy and J.J. Doherty at events around the country and at the then legendary Carrick Regatta. He went on to row with many more great men from the town of his generation; John Desmond Keenan, Cecil Kiernan, Jim Maguire, Aidan Nangle, Cecil Harman and Joe Cregg, to name but a few. His proudest rowing achievement was stroking an eight which represented Connacht in the Interprovincial Championships on the Liffey in 1957 only to be beaten by the Leinster crew (the Guards) in the semi-final who went on to win the title. His fellow teammates become lifelong friends and they continue to visit Carrick Regatta to this day. Tony moved to London after the mid 50s with the love of his life Peggy nee Regan, who he met in Marty Beirne’s in 1952. He left behind his beloved town and club but not his rowing career. In 1959 with the help of Liam Lynch, Mary Mulvey, Cathal Gilroy, Joe Regan, Noel O’Driscoll, John Corrigan, Eamon Reynolds and Jim Cummins, he founded the London Irish Rowing Club in Hammersmith. Lucky for us, he returned to Carrick in ‘63 and took up a position in General Plastics in St. Patrick’s Park where he worked for many years and was a very popular work colleague. He settled down with his darling wife Peggy to raise their family on the Boyle Road. 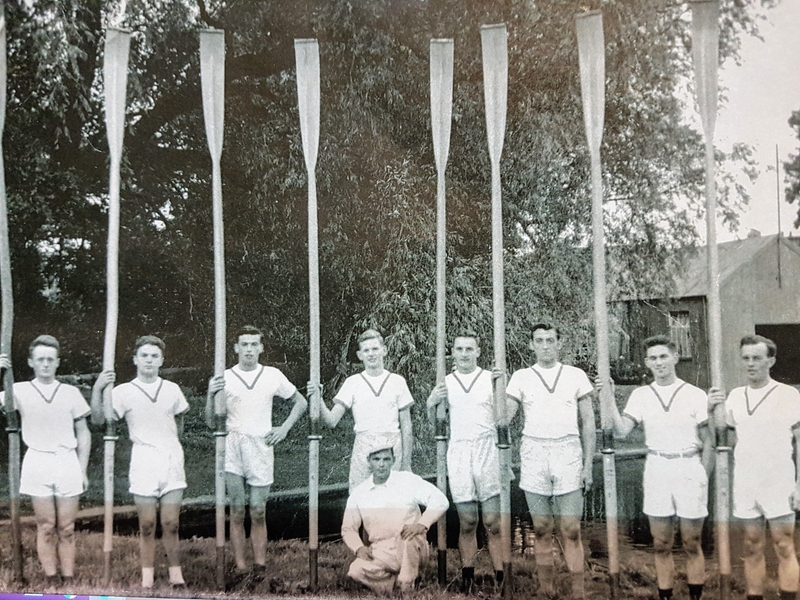 With his family’s patience and endless support, he dedicated all his free time to the rowing club and created the legacy that he leaves behind today, working constantly to grow the club, coaching numerous generations of young people in the intricacies of the sport, organising the infamous regatta days and heads of the river and fighting tirelessly for the club’s financial and sporting survival. His achievements within the club are too many to mention but the name a few; he was instrumental in developing the growth of women rowing in the club and a number of crews went on to great success nationally and internationally in the 60s and 70s, including Carrick’s Olympian Francis Cryan. In 1968 he coxed along with Gabriel Cox, a four of men from the club (Noel McDermott, John Joe Beirne, Sean Layden and Al Monaghan) who were the first crew to row the length of the Shannon facing the almost insurmountable challenge of rowing across Lough Allen and Lough Ree in treacherous conditions and all to raise money for charity. For many decades, he brought crews to heads of the river and regattas all over the country. He made friends everywhere. He built a long-lasting relationship in particular, with many of the Northern clubs, especially Bann Rowing Club and that relationship became even stronger during the troubles as a mutual love of the water superseded any sectarian divide. He realised over 40 years ago the potential of Lough Rynn as a premier rowing centre and that belief has been appreciated in recent years with the development of the impressive national rowing venue Lough Rynn has become today. He fundraised during lean times for the town and they gave him their full support, which he was always very grateful for. A proud achievement for Tony was the building of a new boathouse which was opened by then President Mary McAleese in 1998 and she became one of Tony’s biggest fans. But what he will be most remembered for by his many fellow rowers and friends is his open laughing face, his stylishness, his immense kindness and inclusiveness, his generosity and his wicked sense of humour. Without Tony, we would not have the club we have today. He leaves behind a vibrant, active rowing club with over 80 members and a legacy that will continue for many years to come. The committee and members of the club old and new would like to pass on their sincerest sympathies to his daughters Annette and Michelle and his son Tony Jr, his sister Margaret, his grandchildren and great grandchildren and all the extended family at this sad time. We loved him dearly, we miss him and we will never forget him. The late Tony Keane, second from right, pictured with the Carrick eight that represented Connacht in the 1957 Interprovincial championship. (From left) Ronnie Myles, Tony Feely, Tony Hayden, Josie Murray, Aiden Kelleher, John Desmond Keenan (for Padraig Murray), Leo Hennigan, Tony Keane, Aiden Nangle.